Nissan is now developing collision-free vehicles by mimicking the behavioral patterns of a school of fish in avoiding obstacles without colliding with each other. 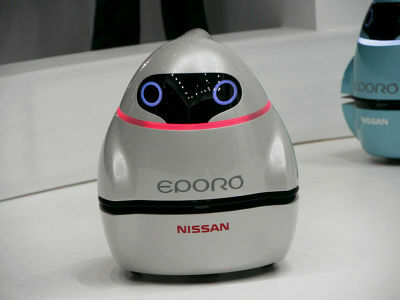 To showcase this new technology, they made adorable robot cars named "EPORO" and exhibited them at CEATEC JAPAN 2009. Here's our videos of the cute little robots moving around watching out for each other. They've even got different personality according to their body colours. 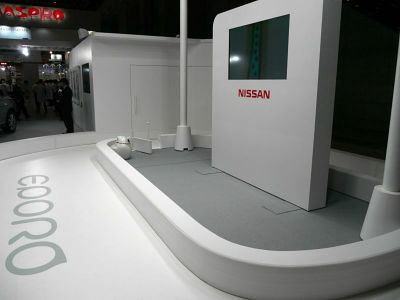 Nissan's booth at CEATEC JAPAN 2009. Waiting for the robots to come out. 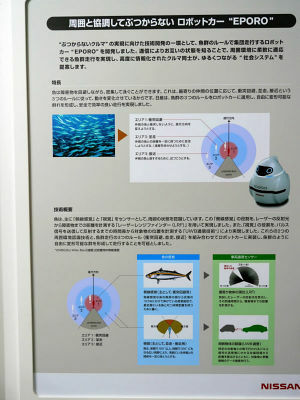 Generically, fish recognize the surroundings based on lateral-line sense and sense of sight and form schools based on three behaviour rules according to the area. EPORO adopted these behaviour rules. And finally, robot cars "EPORO" came out. The strip around their necks shines pink and blue. 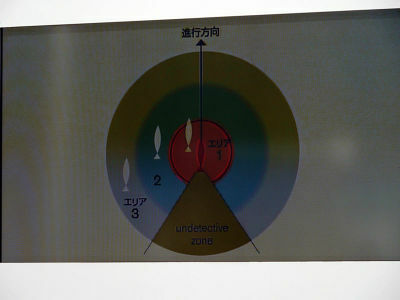 They are each given different personality (behavioural tendencies). 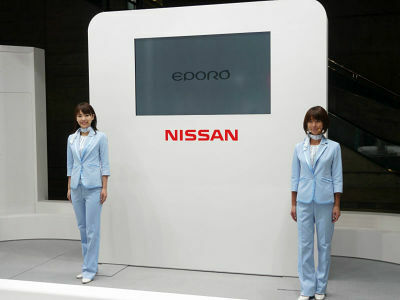 The unmoving EPORA was placed as an obstacle. Watch them avoid the obstacle. Going into a narrow path. Looks like a vacuum cleaner from behind. The body colour and texture looks like Nissan's vehicles. These robots will make you smile. 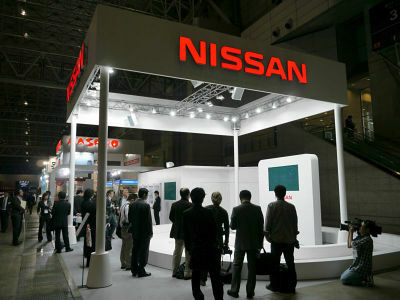 The technology itself is of course amazing, and Nissan did a great job demonstrating them by these robots, making it approachable and comprehensive to general audiences. Description board on Nissan's "Safety Shield Plan" combining vehicles and infrastructure. The concept is that the vehicles should protect human, should be a shield rather than weapon. They're now working on collision-free cars applying frontier technology. And developing a system to provide information on vehicles and pedestrian out of sight to the driver. The show was attracting a huge crowd each time. Seems to be one of the most popular exhibit in the whole CEATEC.